When I worked my after-retirement, parttime bank teller job, my branch was located in a Denver neighborhood with a large Russian immigrant population. Immigrant as in displaced Russian Jews who came to America decades ago; who are certainly in the last decade of their lives; who live on a monthly disability, Social Security or displacement settlement stipend administered by the US government and automatically deposited into their bank accounts. 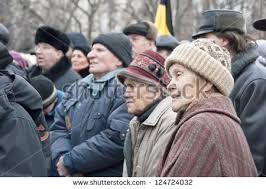 On the last Friday of every month, a steady parade of 4’5″-5’0″ tall Jewish men and women – widows, widowers or married couples – marched into the bank on aged, stiff joints wearing their heavy overcoats, warm ear-covering hats and sensible walking shoes. Many used canes, and all were so squarely built nothing could topple them. On the paper was a scribbled account number. I’d look up the account balance, write it on the paper, and turn the paper towards them. They’d study the paper – if they were a couple, they’d whisper to each other in a language I couldn’t name – then painstakingly print a dollar sign and a 3-digit number on the paper. 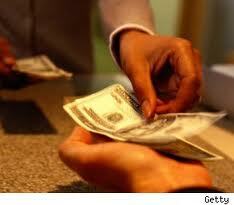 That was the amount – always in NEW hundred dollar bills – they wanted to withdraw from their account. Quietly in English, I would slowly and deliberately count the bills to them as I laid each bill on the counter. They would slowly – in Russian or an Eastern European language – count the bills a second time to themselves or each other. After methodically placing the bills in a black purse or trouser pocket, they would push the piece of white paper back to me a final time. I’d mentally subtract the withdrawal amount from the balance I’d previously written, and write the new balance. They’d study the paper; whisper to each other, pick up the paper and pocket it. A few would nod or thank me; others just turned and shuffled out the door. If there’d been such a Counter during my earlier decades, I would have been tempted to stand in line. Now I have the benefit of hindsight, and I view ‘balance’ from a different perspective. 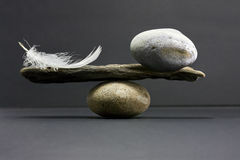 I’ve concluded that well-meaning Life Coaches and ubiquitous ‘Healthy Life’ articles exhorting the necessity of balance in your daily life are just a current-trend version of the ‘You CAN Have It All’ myth. I was in my early 30’s when I rejected the ‘You CAN Have It All’ harpies. You can’t. I couldn’t. No one does. Is it possible we’re stressing ourselves more by reminding ourselves how out-of-balance our lives are during any given week, year, crisis, or life event? You name it; life brings it. Generally not in a balanced pattern. Thank you, Lainey 😊 so-called gurus make a fortune selling us unrealistic expectations, or make us feel so incompetent thinking others are meeting standards we can’t achieve. It’s White Noise we can live without. A contented life is a balanced life. If we pursue contentment, balance will take care of itself. She disagrees and insists I need to balance my life with other things. She says I should start with the hooks in her bathroom that I promised to put up in September. I tell her that the television doesn’t watch itself. Contentment is the key. I preach the concept of ‘enough’. Did she fill out a work order requesting those hooks get hung? That’s what my husband always asks when I prod him about a ‘honey-do’. I enjoyed the intro story and I love the way you tied this together. We opted out of the “you can have it all” and decided that my wife would be a stay-at-home mom. I’m not sure what we gave up, probably a nicer house and a quicker pace of turnover on those cars, but I’m pretty sure I know what we gained. Maybe not balance. Maybe the scale was tipped to one side, but it worked for us.Greta post Sammy. Thank you, Dan! I’d say all three of you gained far more than you gave up. The key is in understanding we have choices and to make them thoughtfully with decisions that are right for us, despite ‘norms’. We had a seminarian at the church we were attending back in the ’80s that had a bumper sticker on her car that said “Why Be Normal?” I always liked that. Another really good post, tied nicely together! I have stopped reading magazines and we don’t have television (we rent movies). The final straw was when this big recession hit, and we were struggling and watching friends lose jobs and go on permanent unemployment then on to welfare or to live with kids (us over 59 folks), and all the while the news was ranting about how it was all about how we all had charged our cards with luxuries — excuse me? So yes, I’m an insomniac and don’t want to hear how I will die younger because I can’t sleep (if I could sleep I would dangit stop stressing me) and so on. I don’t remember the last time we had “balance” but we do manage to have a good time even when life is serving up hardship and sadness. We have the Best-Time-Of-The-Day, and it is ritual and it is the end of the day when cats are underfoot and I’m usually cooking and we are chatting then curl up for dinner and a movie or good books. Curling up. Very important. Thank you, Katie for being such a constant support. Balance is elusive, but it’s the little things – like knowing your best-of-day ritual that keep us going during the toughest times. In my working years, it was closing the bathroom door (shutting out the world) and sinking into the bathtub with bubbles and a good book at night. Oh yes! Bubble bath + book and closed door. Miss it. We currently have NO bathtub!! Altho I have greatly reduced the number of baths I take. Not sure why other than my stress level is so diminished compared to those ‘career years’ that I don’t have the same need. What a lovely insight to a part of your life Sammy and cleverly tied into achieving balance in ones life. As a Libran I need balance, otherwise I am a very unhappy person, but all that weighing up the pros and cons does rather take its toll. Quite often by the time I make up my mind it is too late! The ship has sailed so’s to speak 😉 But I definitely subscribe to the mantra “you can NOT have it all” but you can have a GOOD time. Thank you, Jude 😊 I’m trying – with my life snippets – to distill my writing to the tiny details to paint a picture. I hope I’m improving on that piece of writing skill. I do love your mantra – it’s not only true; it’s empowering. This is my favorite post from you. Beautifully told. I can picture these patrons, and you, the exchange pregnant with meaning and understanding, which you obviously noted down in your book of grace to be measured against the lessons of life. I can’t tell you how much you mean to me, and your wise words and support mean. Thank you for your friendship, and this post. I’m with you–I’m not a big believer in having it all, at least not all at the same time. I believe life is a series of chapters. Things in our lives take a back seat depending on what chapter we’re currently in. But that doesn’t mean they have to disappear entirely. We may get to revisit them as time goes by. You are so right, Carrie. My life has definitely been lived in chapters and, as you mention, each chapter seems to highlight a different aspect of people, place, activity or state of being. I do love revisiting it all – even the tough times resonate in retrospect. Thank you so much for your steady encouragement and interest. What a great story to anchor your musings about life balance. I agree that life balance is not properly understood. The trendy thinking implies that life should be ‘balanced’ day-to-day… and that’s just not realistic. Sometimes one area of our life may take priority for days, weeks, even months – whether it’s the job, family, personal. I think if people looked at the bigger picture, there wouldn’t be so much discontent. I noticed the comment about NEW bills only and I’ve often wondered why the preference. With the banking machines today, I hate the new bills. Thank you, Joanne. One of my favorite parts of writing practice is trying to meld a life snippet with a more philosopical musing. They are few and far between, but satisfying when I find a ‘dovetail’. I’m not sure why the Russians insisted on new bills, but we also had a large bank customer base of Somalian and Ethiopian immigrants from a nearby neighborhood. Many African immigrants send cash to their family in their native countries (yes, CASH BY MAIL) and they also insisted on NEW $100 bills because of the rampant counterfeiting in those countries. The NEW bills had far more anti-counterfeiting security preventions via the printing process, making it easier to quickly tell a counterfeit bill. Older bills – printed with fewer security features – are easier to counterfeit. It makes complete sense about the security features … plus I was aware that people prefer a new bill if it’s going to be used for a gift. I must say that it does annoy me when a business tries to give me a ratty, chewed-up bill. Why not just put it in the day’s deposit and allow the bank to take it out of circulation! You’ve hit several nail heads as evidenced by the many good comments and dialogue. Great post. Christine, a playground is a great analogy, and I agree. Balance is overused and not reslistic in most cases. Thanks for sharing your thoughts! Excellent. Excellent post, excellent example, excellent transition. You’re right, you cannot have it all, and if you do, it lasts ten seconds or less. Thank you, Joey 😊 i truly appreciate your compliment! it’s a constant struggle for families and individuals to embrace what’s real in daily life as opposed to what marketers of products and services ‘push’ as the next greatest item or lifestyle concept. Our lives aren’t missing as much as they’d have us believe. beautiful. it is like a sermon, with a captivating illustration and a moral lesson! Thank you, Jane 😊 That means a lot coming from one who writes sermons professionally. Sammy, oh man, so true. Women particularly were lied to about this having it all. Where is my Calgon bath? Ive been waiting for 40 years! Love the bank story! Women sure were! It has caused a lot of angst, misguided choices and feelings of ineptitude. I don’t like the messages EITHER gender has been ‘sold’. Josna – thank you so much for adding your thoughts. I’m always surprised by which posts elicit the most robust responses. It’s part of the fun of blogging. The Rolling Stones definitely were singing the right tune! Too many of us get mired in elusive, empty pursuits or self-pity when we listen too closely to all the chatter about how much better our lives could be. For the most part, we DO get what we need, and that includes challenges!! You write so beautifully, Sammy! Isn’t it amazing how these newfound “specialists” who call themselves life coaches come in and show us that we are miserable? To think we had no clue! Life ebbs and flows: hard stuff, easy stuff, fun stuff, crappy stuff. Life, like a marriage, it is not 50/50 all the time (almost never, to be truthful!). Sometimes 80/20, 40/60, etc. I think at the end of your lifetime you can tally up and find that your balance, if you lived a full life with authenticity and honesty, will show a nice balance! Looking back you’ll see that there were moments of imbalance and that’s OK. Thank you, dale. I appreciate your compliment and you weighing in. that reminder about percentages is powerful – I think an awareness of that is critical to working together during the hard times. Great story, Sammy. Having it all, good as it sounds, remains a very tall tale. And so true especially for women, who take on way to much and fall on their knees too many times. It was Eleanor Roosevelt, I think who said something along the lines: Women can’t have it all, to paraphrase, and boy, was she right. I thoroughly enjoyed your story and the visual you’ve offered with : “Bullenz, plizz.” Something to keep in mind. Thanks, Silvia. I’m still amazed at the flurry of messages we get from so many sources promoting the ‘full’ lives we should all be living EVERY SINGLE DAY!! I suppose each has to sell his/her specific product or service, but it’s hard not to feel off-balance too often. Great food for thought. I know I definitely can’t have it all… there just aren’t enough hours in the day or energy in my body! I’m more happy when I thoroughly enjoy the things I am able to accommodate than when I try to cram too much in. Definitely. I almost hate picking up so-called Lifestyle and Healthy Living magazines. They make it seem like we can make EVERY day better, and sometimes we simply can’t. Then we beat ourselves up thinking everyone else is able to ‘overcome’. Meh nothing wrong with having a bad day, month,year. That’s life!